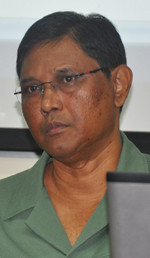 indicates that within the last eight months, Guyana’s log export figures have doubled – in stark contrast to previous statements by the Guyana Forestry Commission (GFC) that the nation’s forests are not being exploited. This is the opinion of A Partnership for National Unity (APNU) Executive Member, Joseph Harmon, who sits on the Parliamentary Sectoral Committee on Natural Resources. According to the Forest Products Development and Marketing Council of Guyana Inc. (FPDMC) in its August 2014 Market/Export Report, Guyana’s log exports for the first eight months of this year have more than doubled when compared to the same period in 2013. The report explained that an astounding 86,250 cubic metres of logs were exported between January and August. This raked in US$14.5M. However, when compared to last year, for the same period, the report showed that 41,518 cubic metres were exported and this earned over US$7M. The report also reveals that for this year, up until August, log exports made up about 46 percent of the total forest exports as against the 30 percent for last year. “The report shows clearly that the figures have doubled, and we are still in October…that in itself speaks to the extent of the exploitation of the forests,” Harmon stated. “I have said before that I have no confidence in the Commissioner of Forests. He continues to be a sore disappointment at such a pivotal agency. What will he have to say now? There is nothing that he could say to justify the exportation of logs being doubled. In my opinion, the resources of this country are not being competently managed. 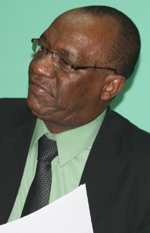 In this case we cannot rely on the Guyana Forestry Commission for an accurate assessment,” the Opposition parliamentarian lamented. He stated that while some parliamentary sectoral committees have already commenced work, the Committee on Natural Resources is still to meet. He said that when it does, certain standing matters would most likely be organized and dealt with, but given the findings of the recent report it is imperative for the Commissioner provide answers to the nation. “The Commissioner may have wriggled out of a debate, but he will not be allowed to escape parliamentary scrutiny. Once the committee meets, I will certainly be the one proposing the pertinent questions,” Harmon emphasised. There has been an increasing debate over the exportation of logs and whether the Forestry Commission is allowing certain companies to exploit the country’s resources. The Guyana Forestry Commission which is entrusted to be the regulatory body over the country’s forestry resources has insisted that it has a handle on activities, with harvesting still way below expectations and targets. for US$1.9M alone with 10,000 cubic metres. India followed next with US$311,000 and 1,537 cubic metres. Some 60 cubic metres went to Hong Kong in August, earning US$12,681. The main goal of the FPDMC is to promote and enhance the sustainable growth and competitiveness of the forest products industry through targeted industry development initiatives.